Veteran keeper Amy Howard has 31 career wins and 16 career shutouts under her belt. Auburn senior keeper Amy Howard knows what it’s like to be tested, just not what it’s like to be tested this season, not so far. During Auburn’s season-opening weekend, the Tigers’ defensive back line held Georgia State to one shot — none on goal — in a 1-0 victory, before holding High Point shotless during the first half of a 4-1 win on Sunday. Auburn frustrated attackers and maintained possession in a defensive effort worthy of conference recognition, and that earned Howard with a couple of relaxing days at the office. Things won’t be so easy starting tonight, as the No. 21 Auburn Tigers take on the No. 8 Pepperdine Waves in a 5 p.m. CST match that will be video-streamed live at PepperdineSports.com. Pepperdine, and Sunday’s opponent UC Irvine, will prove to be two of the toughest tests on Auburn’s non-conference schedule. Both squads’ forwards will come with plenty of challenges for Howard at the net. Luckily for Auburn, Amy Howard is no stranger to facing challenges. After all that she’s has had to go through in her career, she’s ready for just about anything. It was around this time last year that Howard was sitting on the bench, suffering from a torn ACL and brewing over what should have been a season-ending injury. Without Howard’s upperclassmen leadership, Auburn stumbled out of the gates to a 4-1 loss to Wake Forest in the 2011 opener. For Auburn soccer head coach Karen Hoppa, the thought of losing a key asset in goal was nothing compared to seeing one of her players so devastated. “Her going through that injury was a crazy string of emotions, for her of course, first and foremost, and for all of us,” Hoppa said. “It was really heart-wrenching. She had had a great spring. She was playing the best soccer of her career and getting ready for her junior season. Then we all thought she’d miss the whole year. 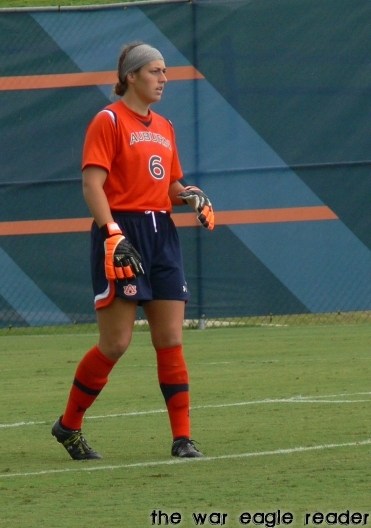 While the Tigers planned to redshirt Howard and scrap 2011 for the veteran keeper, Howard kept working, rebuilding the strength in her knee and, amazingly, completing her rehabilitation just 16 weeks after tearing her ACL in the summer. Even after making it back to playing shape, the question remained whether or not to redshirt Howard, after she had already missed the first eight games of the season. But Howard made her return to the field in the second half of Auburn’s SEC opener against Kentucky, helping the Tigers to a 4-1 victory over the Wildcats. Howard’s return eventually made the Tigers’ postseason run in the SEC Tournament possible, with Howard tallying shutouts against LSU and Tennessee in the tournament’s first two rounds before Auburn’s 3-2 win over Florida in the championship game. Now, in 2012, Howard is looking to help lead her team to even more success with a productive — and healthy — senior campaign. Of course, according to Coach Hoppa, leading is nothing new for the Tigers’ last line of defense. Hoppa is hoping that Howard brought that leadership across the country with her for tonight’s matchup against Pepperdine. For Auburn to have a shot at the upset, or at a win on Sunday against UC Irvine, the Tigers have to keep scores low with some strong play from their veteran keeper and her defensive back line. Even in the face of top-tier competition, Howard thinks her Tigers are up to the challenge. And after fighting through injuries and disappointment, Howard’s ready for just about anything that comes her way. She just has to make sure that what comes her way tonight doesn’t get past her. TWER photos by Amy Thorington. Related: Auburn soccer dances to Beyoncé in team-building ‘flashmob’. Check out our Auburn Soccer Season Preview here.